U.S. Communities and National IPA, both wholly-owned subsidiaries of OMNIA Partners, have come together as OMNIA Partners, Public Sector. All public sector participants already registered with National IPA or U.S. Communities continue to have access to all contracts, with certain exceptions, in the portfolio and do not need to re-register to use a legacy National IPA, legacy U.S. Communities, or new OMNIA Partners contract. U.S. Communities and National IPA remain separate legal entities and lead agency contracts completed under each brand are effective and available for use through the contract’s approved term. In the event we believe re-registration is necessary for any reason, OMNIA Partners will let you know. Non‐Roofing Related Trades (e.g. masonry, windows, walls, doors, etc. 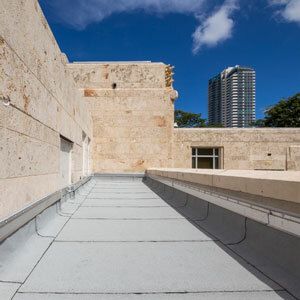 Garland’s new, flashless metal edge system eliminates the need for flashing plies that would ordinarily be installed at the roof’s edge, saving time during installation and costs on labor and material. Garland sets new industry standard in UV and aging performance with the introduction of its thermoplastic KEE-Stone membrane. It is designed for use as part of a two-ply hybrid roof system to stand up against the harshest weather. 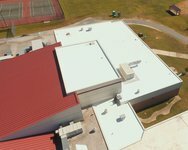 Polyurethane-modified asphalt-based roof membrane designed to extend roof life. Step 1: A Garland/DBS estimator will apply the Master Agreement pricing to the scope of work defined for each project by developing a line-item price breakdown based upon the actual dimensions of your roof. This serves as our Guaranteed Maximum Price for the project. Step 2: Since roofing and waterproofing projects are never considered to be a standard application or configuration, there are an infinite number of combinations that can result across the country. Garland/DBS’s site-specific pricing model aims to further reduce the final project price by administering a fully transparent, informal process for obtaining competitive quotes on each project from local Garland approved contractors. Step 3: Once the general condition costs, standard overhead and profit are applied to the lowest qualified quote received for the project, the site-specific price is compared to the Guaranteed Maximum Price. If there are any savings generated using the site-specific price, they are passed directly to the Participating Public Agency in the form of a site-specific discount. How do I place an order with Garland/DBS, Inc.? To place your first order, please contact us to establish your Garland/DBS, Inc. account. For all subsequent orders, please contact your locally based representative. 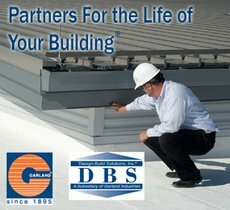 What exactly is covered under the Garland/DBS, Inc. contract for Roofing Supplies, Waterproofing and Related Products and Services? What if a product or service is not found in the catalog? According to the terms of the contract, Garland/DBS, Inc. will price all items not specifically listed in our catalog using RS Means stated cost with a mark-up percentage. Are there incentives for agencies to purchase turnkey, rather than materials only? Yes. Every agency will be offered the opportunity to further reduce its installed costs on a per project basis by allowing the local Garland/DBS, Inc. representative to bid the labor portion of the job to Garland’s locally based approved contractors. If the pricing comes in lower than the Guaranteed Maximum Price based on the initial contract, the Agency will benefit from that cost reduction, which will be clearly labeled as such on the final proposal. Does Garland/DBS, Inc. manufacture the products it sells? The Company manufactures the vast majority of the materials sold, as measured by sales volume, with all aspects of product development and quality control under the direct daily supervision of Garland employees. What is its primary sales/distribution method? The Garland distribution model uses over 200 sales representatives who live and work in your agencies’ communities to manage its roofing projects. Sales representatives are dedicated employee owners of the Company, vested in the long-term success of the projects they manage. What kind of field support is available to participants? The Garland/DBS, Inc. sales representatives managing roofing projects receive a minimum of 200 hours of industry-specific classroom and field training within their first year of employment, and a minimum of 24 hours of continuing education every year thereafter. In addition, the sales team is supported by a technical staff that includes engineering, design, and construction professionals. What is the Garland track record for performance? In the last 35 years alone, Garland materials have weatherproofed the roofs of over 200,000 facilities across North America and the United Kingdom, with warranty expenses representing less than one percent of sales and 100 percent funded through its financial strength. How well can Garland/DBS, Inc. support our agencies’ sustainability requirements? Garland was among the first in the roofing industry to commit to green technologies, investing in vegetative roofing capabilities as far back as 1991. The Garland/DBS, Inc. contract offers a wide range of sustainable solutions under its Greenhouse umbrella, including ENERGY STAR® qualified, CRRC, LEED® point contributing, and otherwise independently assessed “green” materials that provide one or more ecologically responsible benefits. A complete list of green products can be found on the Company’s Web site: www.garlandco.com. Advance planning can minimize disaster-related disruptions. 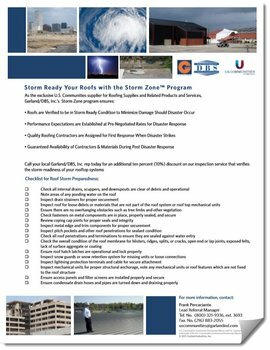 Garland/DBS, Inc. helps get your facilities back up and running as quickly as possible when disaster strikes. Services include emergency notification of first-responder contractors who are pre-qualified and licensed to work in your area. Donec semper convallis elit eu placerat. Duis mattis massa mi, id accumsan massa pellentesque in. 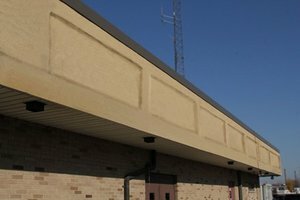 Leading manufacturer and distributor of high-performance solutions for the commercial building envelope.